Here’s an interesting and informative blog post about the visit of a Docklands Light Railway train from London to the Fallowfield Loop back in 1987! Cos Harnasz writes: ‘There is so much history woven into the Fallowfield Loop, of all sorts, and one of the biggest surprises was discovering several years ago that a very special concert had taken place on 7 May 1964 near the present Athol road entrance. It was the site of the old Wilbraham Road station, already then disused, the line having been closed to passenger traffic but still having freight trains rumbling along it. 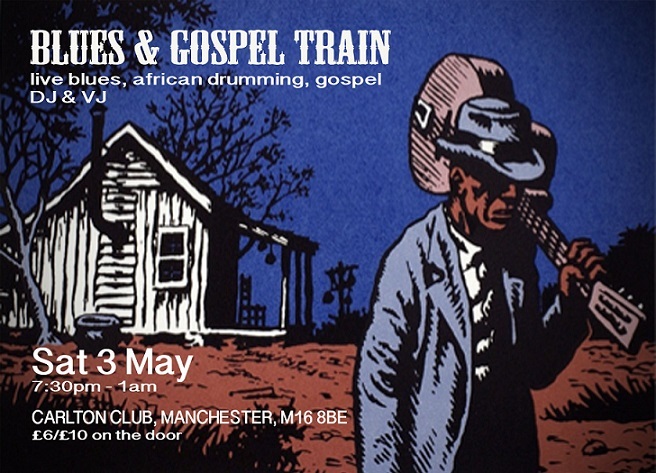 On tour in Britain that year was the ‘Blues and Gospel Train’. It included musicians like Sister Rosetta Tharpe, Muddy Waters, Sonny Terry and Brownie McGhee. Granada TV had the idea to film a show in Manchester and mock up a southern states style railroad station. Ours was the one. The programme was broadcast later in the year – and clips visible down the tunnel of time are available on YouTube. A memorable moment is seeing Rosetta Tharpe saying to the welcoming audience who had come on a chartered steam train from Central Station in the city centre: “England, we love you.” It was the time of Civil Rights back in the USA. With all this in mind the idea kept coming up to celebrate the 50th anniversary as near the original date as possible. A venue was chosen, the Carlton Club in Whalley Range. Jo Banana gathered bands she knew and played in, plus inviting a Gospel Choir; and with Phil Busby, who in addition to being a blues player is also a historian of the blues, the original set of songs sung half a century ago had new life breathed into them, and were performed as a group again. There was a DJ, and (a new one for me) a VJ who projected video and images onto the backdrop and ceiling – including footage from the original concert onto the present day players!